Robert ponders how we can illuminate our paths forward in the face of unpredictable change. 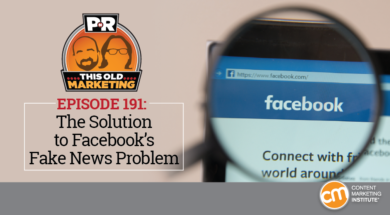 On the news front, we actually arrive at a viable solution to Facebook’s fake news problem. If only Mr. Zuckerberg were listening. We also discuss research findings on artificial intelligence and marketing, and why media companies are lousy at audience development. Our rants and raves include agency changes and more AI; then we close with an example of the week from the U.S. Postal Service. Content Marketing World 2017 – The largest content marketing event in the world returns to Cleveland on September 5–8. 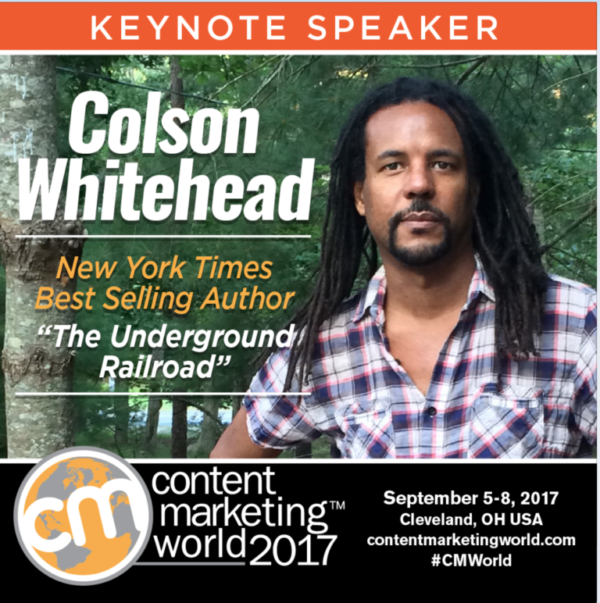 This year’s conference will feature over 120 sessions and workshops presented by leading brand marketers, as well as a keynote address from Pulitzer Prize-winning author Colson Whitehead. You’ll come away from this event with new insights, tips, and tools that will help you create epically successful content. But our discounted summer registration rates are coming to an end on July 21, so register today. And don’t forget to use coupon code PNR100 to save $100 on the cost of registration. (42:50): Robert’s rave No. 1: Robert came across an article in Harvard Business Review that he feels does an excellent job of describing the challenges today’s chief marketing officers face, and explaining why this position experiences the highest turnover in the C-suite. (45:40): Robert’s rave No. 2: Robert also praises this AdAge piece for its insightful look at how Unilever is eliminating waste in the agency equation, including the changes it has made in its production processes, hiring practices, and compensation structure. (47:05): Joe’s rave: With this week’s discussion so heavily steeped in AI, I wanted to give a shout-out to our good friend of the CMI family, Paul Roetzer, who launched the Marketing Artificial Intelligence Institute a year ago. If you don’t understand the implications of this technology on today’s marketing function, I urge you to subscribe to the institute’s e-newsletter. (50:00): U.S. Postal Service: One of Robert’s friends, who is an actor, recently mentioned that he was auditioning for a kids television show called The Inspectors. Robert did a little digging, and discovered that the show – a CSI-style procedural in which (fictional) postal inspectors investigate mail-related crimes – has a unique tie to content marketing: It’s the only commercial television show currently being funded by the U.S. Government. As this Deadline profile piece points out, the show is fully funded by the U.S. Postal Service – but no taxpayer dollars are used to support it. Instead, the show’s budget is generated through asset forfeiture and sales of merchandise confiscated from crimes like the ones the show investigates. With each episode featuring a message from the real-life chief inspector of the U.S. Postal Inspection Service, it’s an intriguing This Old Marketing example of how to use entertainment content to raise public awareness about some serious real-world crimes.